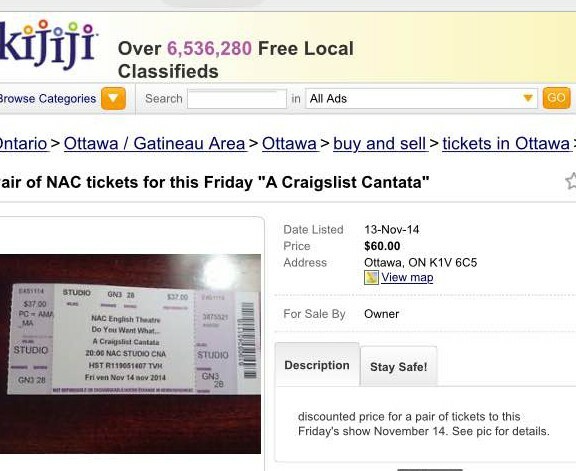 Craigslist Cantata at the NAC. Very happy and proud that this show continues on, and at such a prestigious venue. If you’re in Ottawa please come and check it out. I’m looking forward to seeing how Ottawa audiences are different than Vancouver, Edmonton, Calgary, and Toronto. The folks at the NAC have made this a nice easy load in, the show looks really great in their studio space. And of course, if you need tickets, there are some on Kijiji. Previous Previous post: Enemy of the People at Tarragon. Next Next post: End of 2014, beginning of 2015.